Despite suffering another humiliating defeat in the House of Commons on the Withdrawal Agreement she has negotiated with the EU, British Prime Minister Theresa May continues to ignore all other options. That deal is opposed by Tory extremists and the DUP, who are demanding a clean break with the EU and the return of border controls between the two parts of Ireland. A number of protests are taking place today at border crossings between Louth and Armagh, Cavan and Fermanagh, Monaghan and Tyrone, Donegal and Tyrone, and Donegal and Derry. Spokesperson for Border Communities Against Brexit, JJ O’Hara, said that two decades of peace efforts are at “real risk” because of Brexit. “There’s so much good work done over the last 20 years, from the Good Friday communities,” he said. “So many communities came together, and so many different projects have been developed cross-community and cross-border. 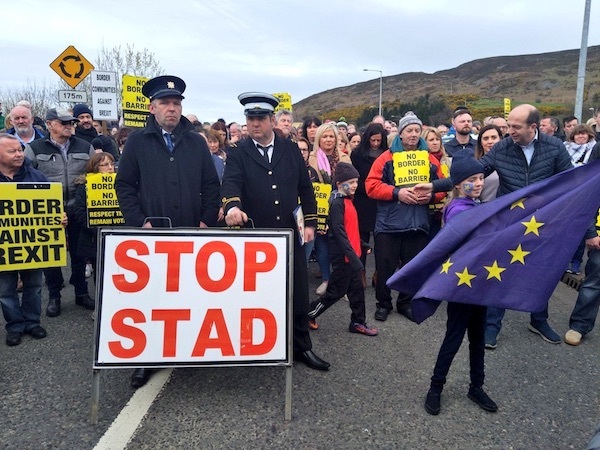 Sinn Féin’s Donegal-based Senator Padraig MacLochlainn said Brexit posed a “huge threat” to the border communities and the economies on either side. “A majority of people in the North voted to Remain and the Tories along with the DUP are ignoring this democratic mandate. Our rights, economy and agreements must be protected,” he said. The British Labour Party has now called on Theresa May to finally accept that her deal is dead and to call a general election. But with only days left before a potentially cataclysmic departure from the EU, May appears unmoved, apparently encouraged by the last-minute support of a number of prominent Brexiteers, including Jacob Rees-Mogg, Iain Duncan Smith and Boris Johnson. She has until April 12th to go back to Brussels with new proposals and seek a longer extension to the negotiation process, or see Britain leave without a deal, taking the north of Ireland suddenly out of the EU against its will. On Friday, to mark the original planned exit day, loyalist flute bands joined fascist Tommy Robinson and about a thousand right-wing activists at a pro-Brexit demo in London. Participants loudly hurled abuse at anti-Brexit MPs, parliament staff and members of the media until night fell. Demonstrators jostled with journalists after the planned speeches ended, and five were arrested. Scottish Nationalist Party justice spokeswoman Joanna Cherry QC said that she was subjected to abuse as she left Westminster and “told to go back to my own country”. On Monday, MPs will stage a second series of “indicative” votes on alternatives to the negotiated deal. In the first round of votes on Wednesday none of the eight options considered - including a customs union with the EU and a second referendum - were able to command a majority, although those options were the most popular. With support for Brexit in clear decline, discussions between the various groups of MPs involved are taking place over the weekend to find a compromise proposal. Another idea would see a crash ‘no deal’ Brexit ruled out in favour of an extension to the deadline of about a year, seen by many as the most likely next step. Most commentators are predicting an imminent end to the political career of Theresa May, something she has already promised her right-wing rivals within the Tory party in return for support to pass her negotiated deal. One plan is for a climactic ‘grand final’ vote next week between her deal and a rival proposal stitched together by backbench MPs. Regardless of the ‘Tory psychodrama’, as one Labour MP described it, the European Union and the Dublin government Taoiseach Leo Varadkar are now exclusively preparing for a crash Brexit on April 12. Tánaiste Simon Coveney has said Dublin’s focus this weekend is turning away from what is happening in Westminster to a “new phase”.